(Nanowerk News) An electrically conductive material, with layers resembling graphene (single sheet of graphite), was synthesized under mild conditions using a well-known molecule that allows good electronic coupling of nickel ions and organic moieties. The new porous material exhibits high electrical conductivity as a bulk material that is potentially tunable and has unusual temperature dependence, suggesting new fundamental physics ("High Electrical Conductivity in Ni3(2,3,6,7,10,11-hexaiminotriphenylene)2, a Semiconducting Metal–Organic Graphene Analogue"). Top view (left) and side view (right), illustrating the porous and layered structure of a highly conductive powder, precursor to a new, tunable graphene analog. The new porous material is a crystalline, structurally tunable electrical conductor with a high surface area; such materials are sought after for applications in storing energy and for investigating the fundamental physics of layered, two-dimensional materials. 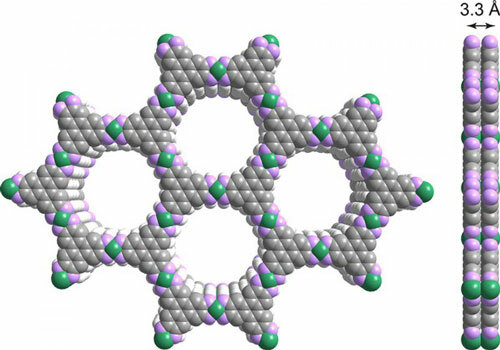 Metal-organic frameworks (MOFs) are hybrid organic-inorganic materials that have traditionally been studied for gas storage or separation applications owing to their high surface area. Making good electrical conductors out of these normally insulating materials has been a long-standing challenge, as highly porous intrinsic conductors could be used for a range of applications, including energy storage. Researchers at the Massachusetts Institute of Technology and Harvard University have demonstrated that combining an organic molecule, 2,3,6,7,10,11-hexaiminotriphenylene (abbreviated as HITP), with nickel ions in aqueous ammonia solution and air causes the self-assembly of a highly conductive porous black powder, Ni3(HITP)2. The new material is composed of stacks of infinite two-dimensional sheets resembling graphite, with a room temperature electrical conductivity of ~40 S/cm. Conductivity of this material is comparable to that of bulk graphite and among the highest for any conducting MOFs reported to date. Moreover, the temperature dependence of conductivity shows a linear dependence between 100 K and 500 K, suggesting an unusual charge transport mechanism that has not been previously observed in any organic semiconductors, and thus remains to be investigated. In bulk form, the material could be used for supercapacitors and electrocatalysis applications. Upon exfoliation, i.e., peeling off of successive layers, the material is expected to behave as a graphene analog with tunable bandgap and electromagnetic properties, suggesting new uses and exotic quantum properties in solid-state physics.